There is a lot more at stake in next week’s election for Canadian prime minister than who will run the country for the next four years (a minority government is most likely). Yes, that in itself is a big undertaking, but if you look at the lead up of this year’s election – the longest one in Canada’s short history – you see clear signs of how the populace has been treated even without an election looming overhead. 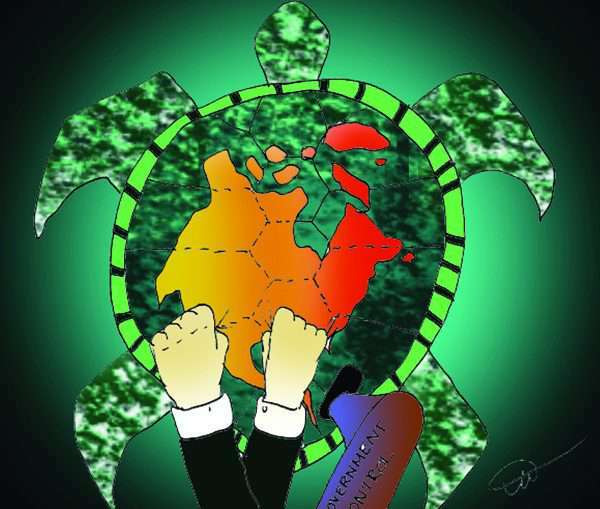 And although we as Onkwehón:we shouldn’t participate in a foreign system that is set up to fail us time and time again – especially as sovereign Kanien’kehá:ka, part of a much older and very separate system under the Haudenosaunee Confederacy – we understand the reasons why some individuals do. They are sick of Stephen Harper, frustrated with his anti-constitutional bills that quite clearly target our communities. But aside from voting on October 19 to “get Harper out,” as First Nations voters have been saying, there are other issues that have come to the forefront that should be examined before and after the vote, things that have been going on for years. It boils down to funding – of our communities, of our entities, for our future. Think back, say, 30 years ago. Let’s look at the main issues we are dealing with today: education, health and land. Sure, there are others, but these ones are pretty much always at the forefront and they speak directly to what should be a relationship between equal sovereign powers, but what has continued to be one of paternalism (them), mistrust (us) and unilateral decisions (again, them) on the most important issues. If you wanted braces 30 years ago and were a registered “Indian” you would get the entire thing paid for. Now? Good luck on that. It costs thousands of dollars, which means some families cannot afford to get their children proper care for their teeth, leaving them with something to deal with their entire lives. Education? Heck, the author of this editorial remembers getting $250 at Christmastime (in high school, no less), but slowly but surely any allowances or bonuses were cut out. Which, some would say, is good in relation to high school students, but caps on who can be funded has meant picking and choosing who gets approved for post sec funding in 2015. How things have changed – and so quickly! The so-called Oka Crisis in 1990 was supposed to result in direct dealings regarding land claims (in the community of Kanesatake especially), to deal with a backlog of land-related issues. To this day the Pines have not been turned back over to the people. This is a travesty of justice and a farce on the part of the Canadian government. If you look at other funding – and this one is rarely talked about – the Canadian government has also cut back on the amount of advertising dollars it spends in community newspapers – which are often the only source of information in a community, let alone an Onkwehón:we one. From five short years ago to today, Ottawa’s budget to advertise things like new health initiatives, educational opportunities, or, merely, to communicate to the people directly on a host of other issues, has shrunk to almost nothing. Last year the federal government spent over $75 million in media advertising, while only spending not even $900,000 in community newspapers: just over $1,000 for the close to 900 audited community newspapers. Community newspapers are widely read by community members, both here in Kahnawake, and in so many other communities across the country. Yet the rush to advertise on the Internet has proven shaky results at best, and when the only information you have is online and not in the paper, you alienate far too many people who like to sit down with a cup of coffee, or over breakfast – especially our elders – and read the news of the day or week. It’s shortsighted and it has a profound effect on the bottom lines of community newspapers, who employ a large number of community members, spend their money in the community, fundraise for and promote important issues, and fight FOR the community with a unique voice and position that gets results. Those are only some things fly-by-night websites, blogs or other news gathering sources simply don’t offer, because they don’t put as much into it. A unilateral decision by the feds to shut you out by choosing one medium over another, instead of smartly using both, is a trend that everyone should be concerned about. Leading up to the election, there have been some Canadian ads in certain newspapers, but it’s a drop in the bucket. It also goes to show you that in order to reach everyone in Canada, the federal government is at least admitting the medium of community newspapers is a viable, important way to get the message out. So why only when it comes to an election every four years? This has to change. Community newspapers are more important than ever and just because you can read some news online, doesn’t mean it can replace the in-depth coverage provided by a community newspaper. The Eastern Door breaks story after story and follows through on so many issues facing Kahnawake and our sister communities. Why? It’s our job. Other forms of media, especially on the outside, in the mainstream, don’t live, breath, eat and sleep Kahnawake. Compare, honestly, the stories we cover to any other outlet covering this community and see for yourself. The importance of community newspapers has never been so clear. The Canadian government has an obligation to protect community newspapers which act as the historical record, as the chroniclers of the most important events, and, so often, the voice of reason. When the federal government refuses to advertise in your local newspaper, they are saying you, the reader, doesn’t matter to them. Would that be any better under a different leadership? We’ll have to wait and see, but if the same shortsighted decision-makers remain in office, don’t hold your breath.